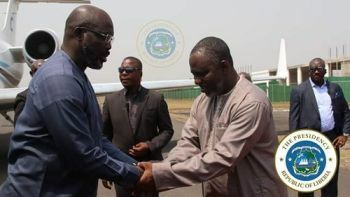 Monrovia, Liberia - His Excellency Dr. George Manneh Weah, leaves the country today, March 17, 2019 for Abu Dhabi, United Arab Emirates (UAE), for a four-day official visit. During the visit, President Weah will meet with Crown Prince Shiekh Mohamed Bin Zayed al Nahyan. The discussions between the Liberian Leader and the Crown Prince will center on fostering direct UAE investment in Liberia and cementing relations between the two countries. The Liberian leader will also grace the closing ceremonies of the 2019 Special Olympics slated for March 21, 2019. Over 7000 athletes including children and adults with intellectual disabilities are competing in 70 sports. While the Liberian Leader is away, Hon. Nathaniel F. McGill, Minister of State for Presidential Affairs, will chair the affairs of the Cabinet in close consultation with the Vice President, Madam Jewel Howard-Taylor and via telephone conversation with the President.